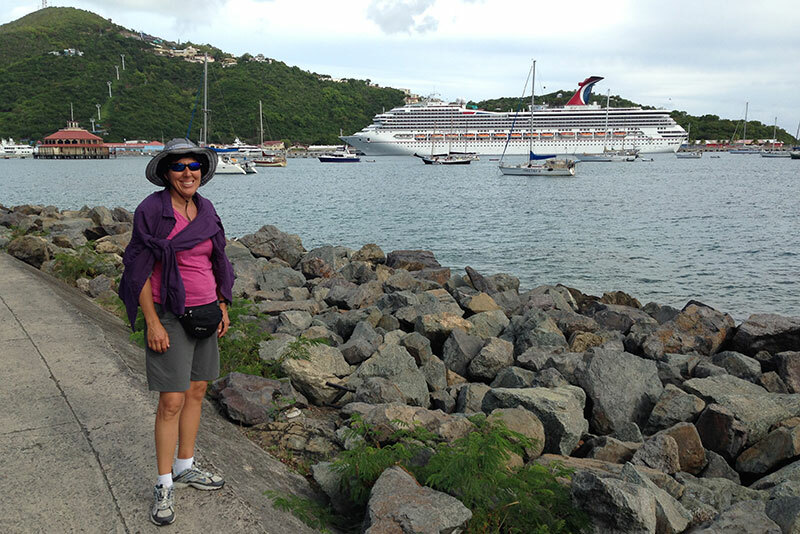 Last spring I joined my wife Monica, her sister, and her mother for a big-ship cruise in the Mediterranean. 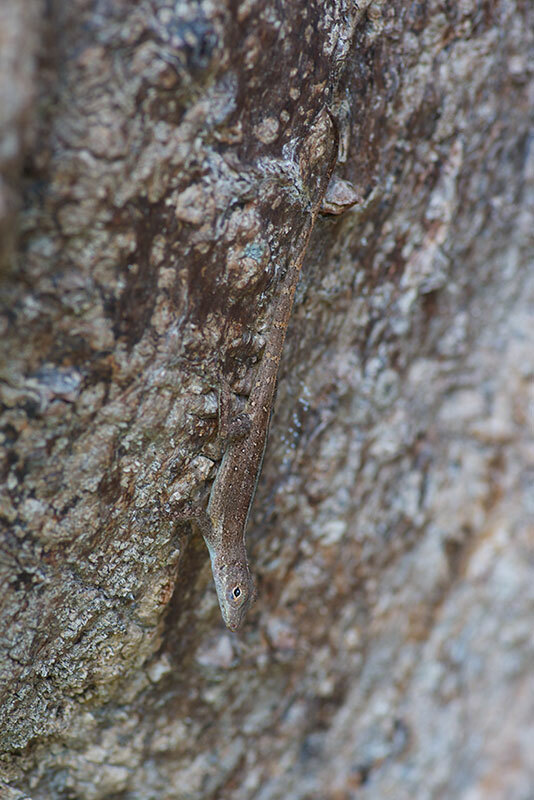 I hadn't expected to see many herps, but I did manage to ferret out a few species. 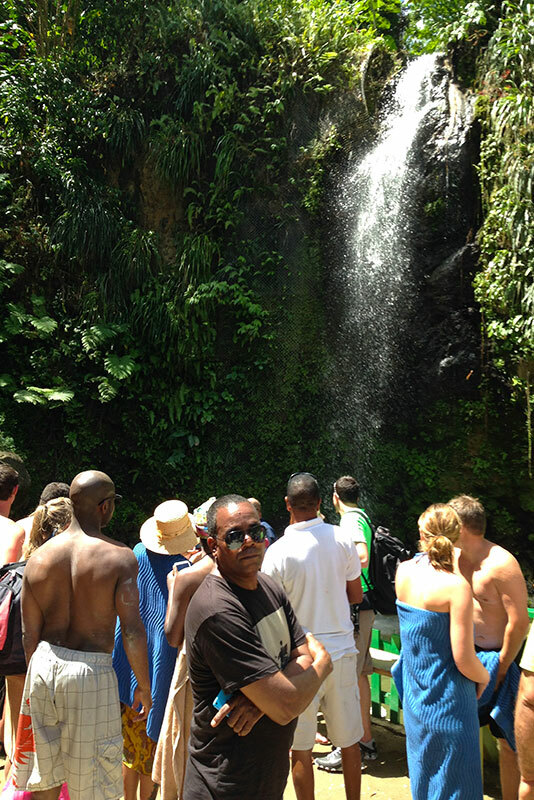 For a sequel, the same set of us ventured out onto another big cruise ship in the Caribbean in May. 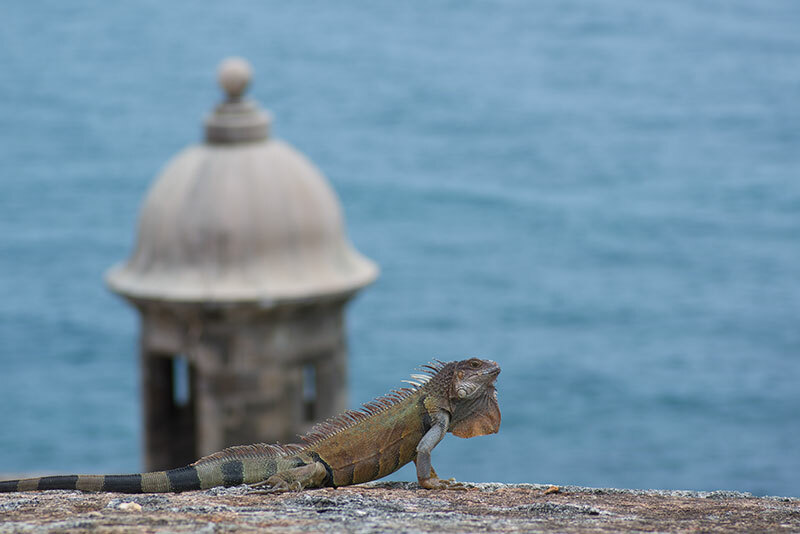 My hopes were a little higher, since the Caribbean islands are famous primarily for their lizard fauna (at least that's what I think they are famous for -- did I get that right?). 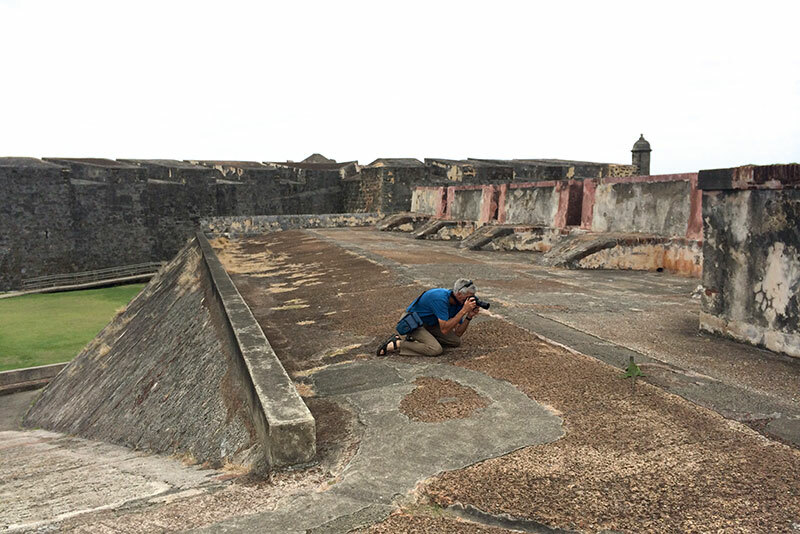 However, being a big-ship cruise, our limited time at each port of call was mostly structured by agendas created by other people, and we would still not be out at night, so I wasn't expecting too much. 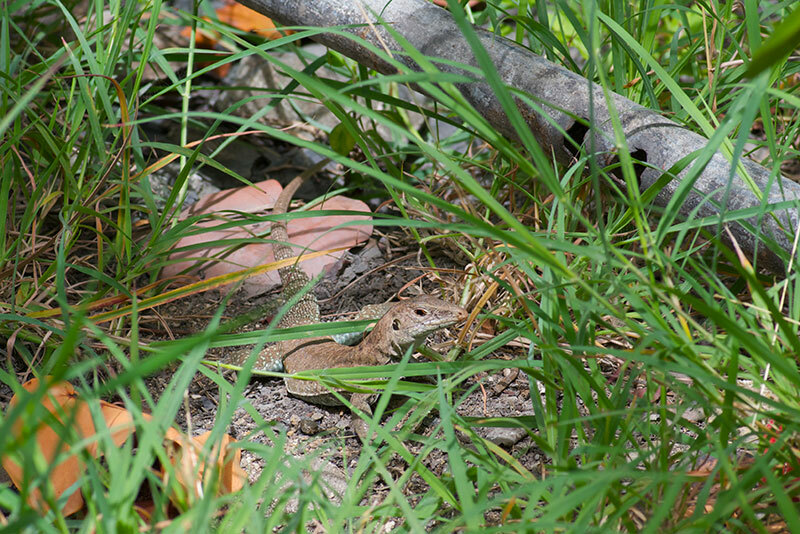 I should warn the ophidiophiles right now that the word "herping" in this story does not mean "finding snakes". 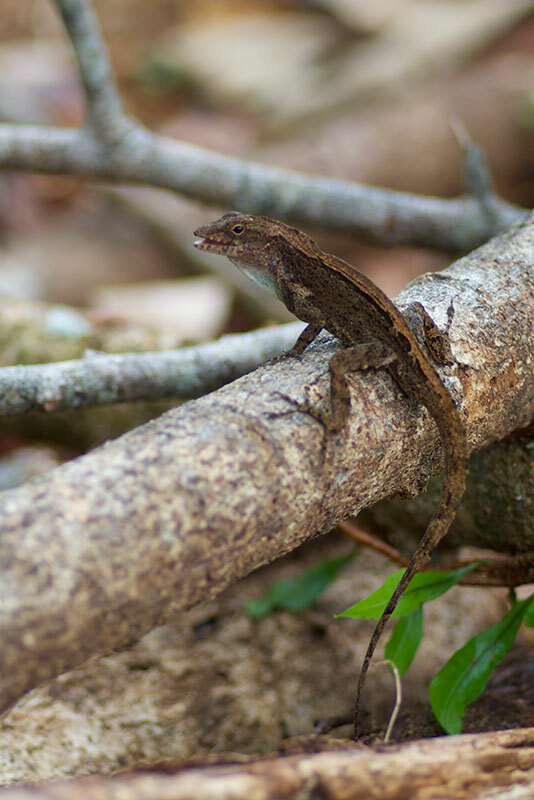 I did have some hope of finding some snakes, and some frogs, crocodilians, amphisbaenians, tuataras, etc., but I was sure that I would find some lizards. 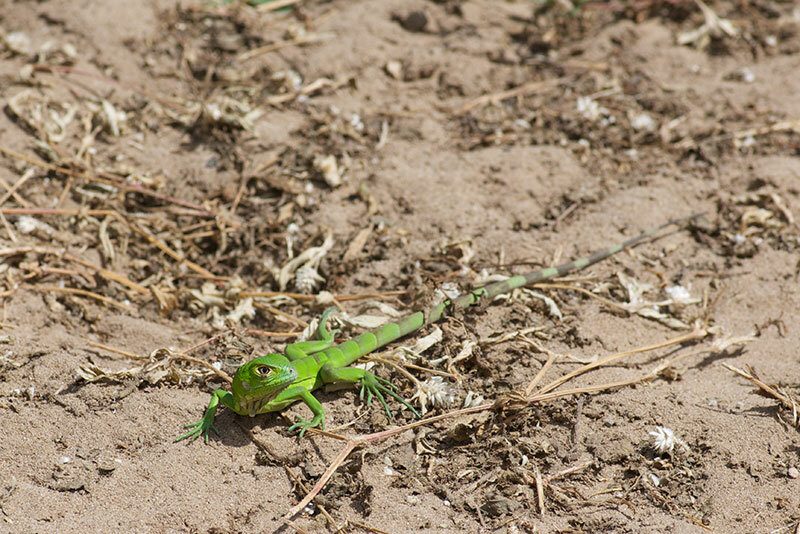 And in the end lizards were all I saw. 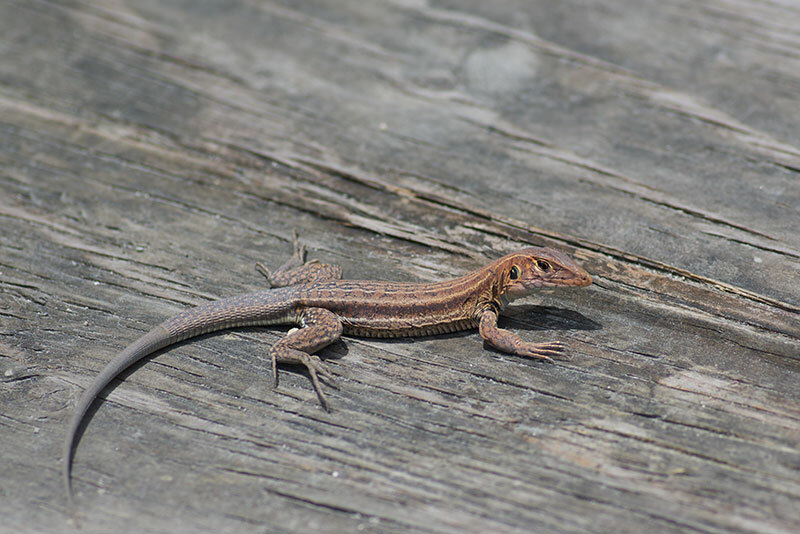 So if you are one of those people who only like the particular group of legless lizards that for some reason is placed in a different suborder than other lizards, you should just turn away now. 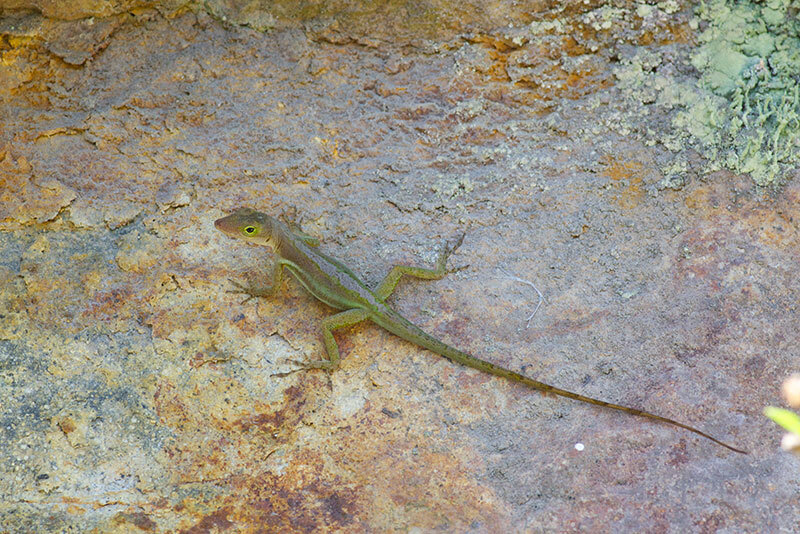 Watching the rocks and trees revealed a bunch of anoles. 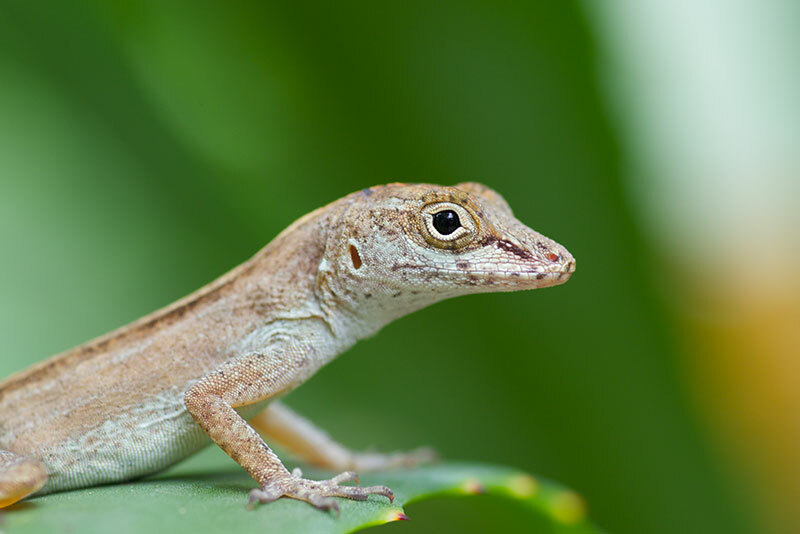 At the time I didn't know whether multiple species were involved, but I now believe (with some confirmation from the knowledgeable folks at Anole Annals) that they were all Puerto Rican Crested Anoles (Anolis cristatellus cristatellus). 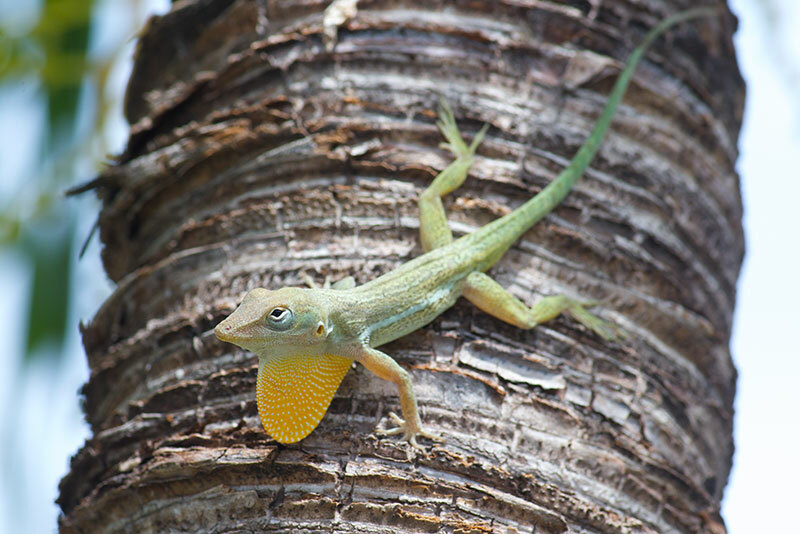 I had seen these trunk-ground anoles before in the Dominican Republic and in South Florida, but it was nice to see them in their native habitat. 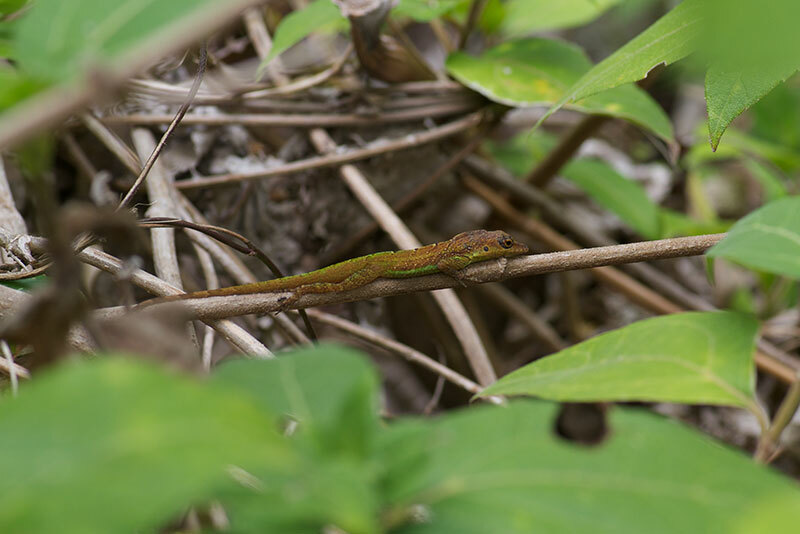 Other than the Green Iguanas and Puerto Rican Crested Anoles, all of the lizards I saw on this trip were species (or, in one case, subspecies) that I had never seen. 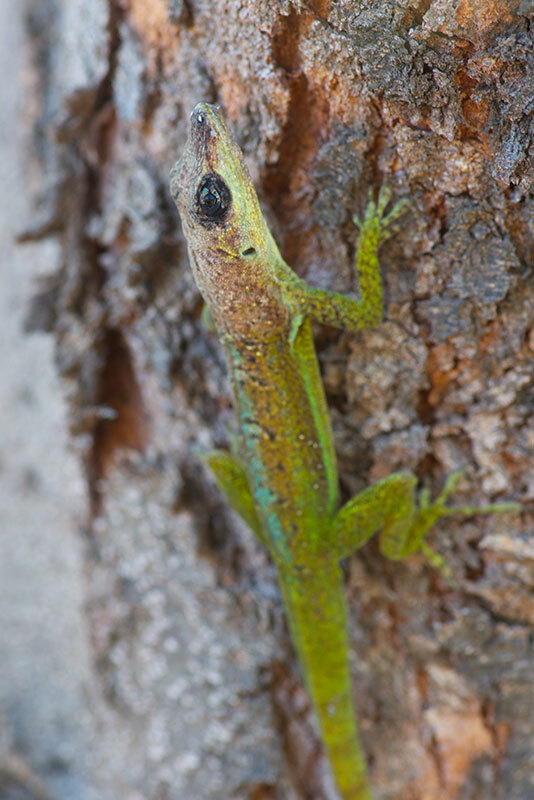 My first lifer species was this pretty Puerto Rican Emerald Anole (Anolis evermanni), a trunk-crown anole like the USA's very own Anolis carolinensis. 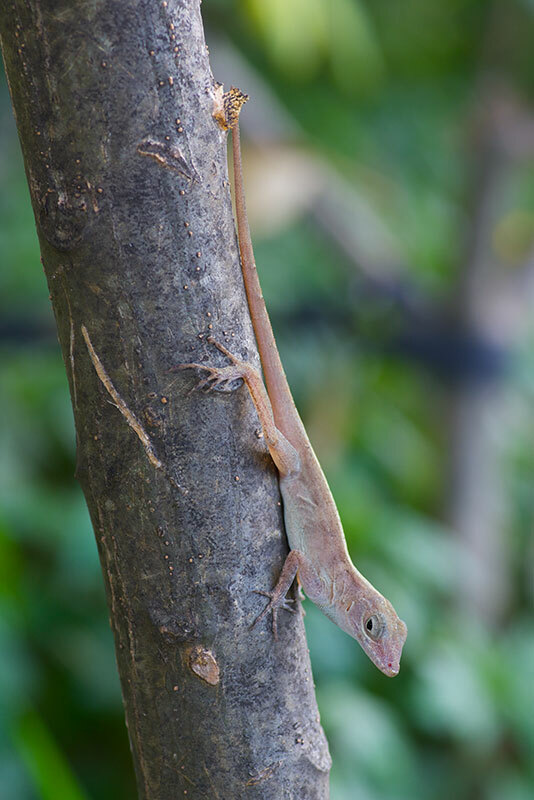 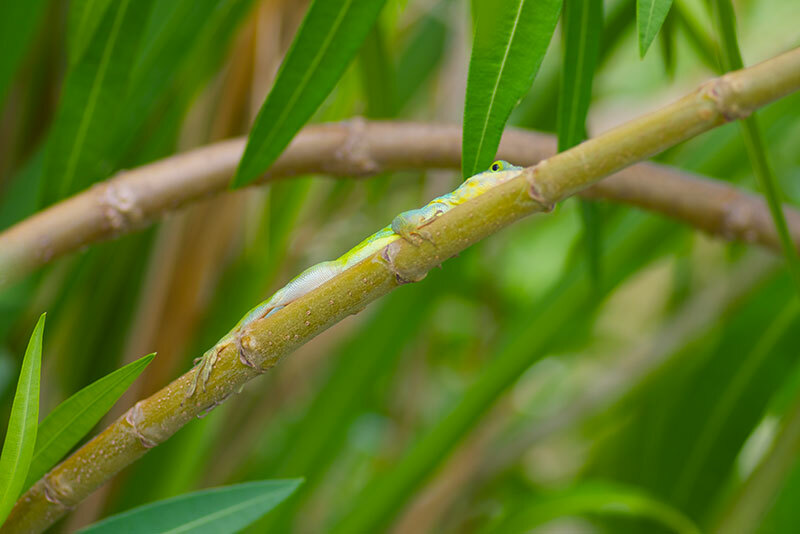 Trunk-crown anoles tend to be fairly high on tree trunks or branches, and they tend to be green for good camouflage against a leafy background. 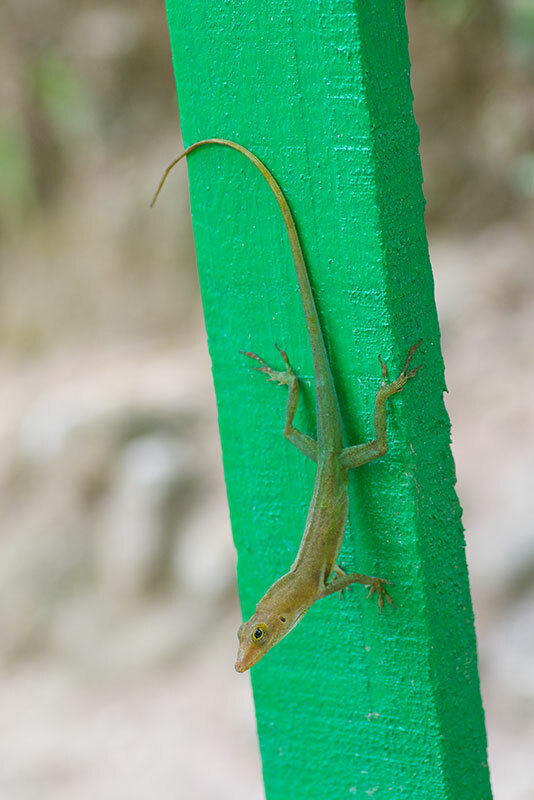 This one, however, was not in a tree at all, but on a post on the walkway bridge to the El Portal visitor center at El Yunque. 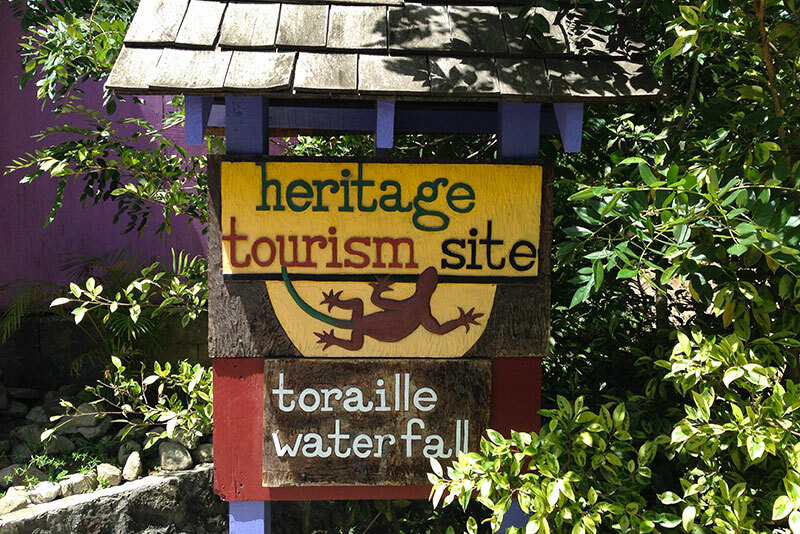 We only had a couple of hours in El Yunque, and part of that time was spent at the visitor center, and another part at a roadside snackeria (I think I made that word up). 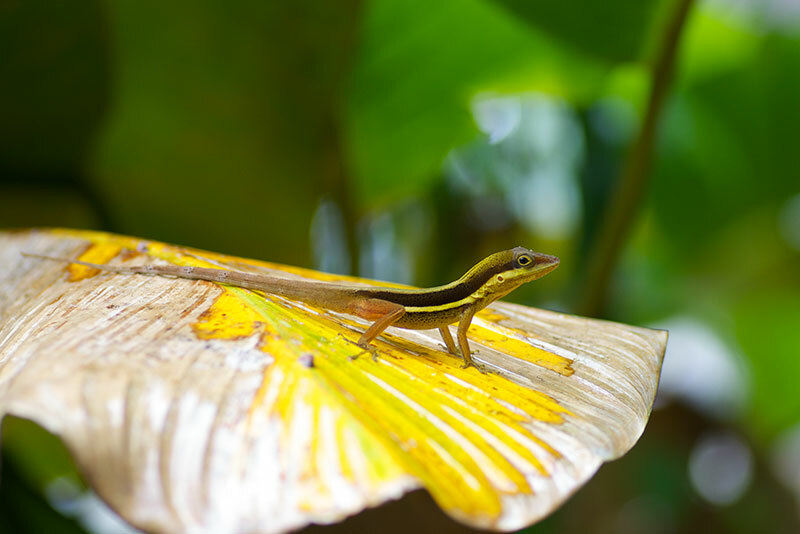 We went on one very short hike to a waterfall, but I didn't spot any herps there, possibly due to the slightly drizzly weather. 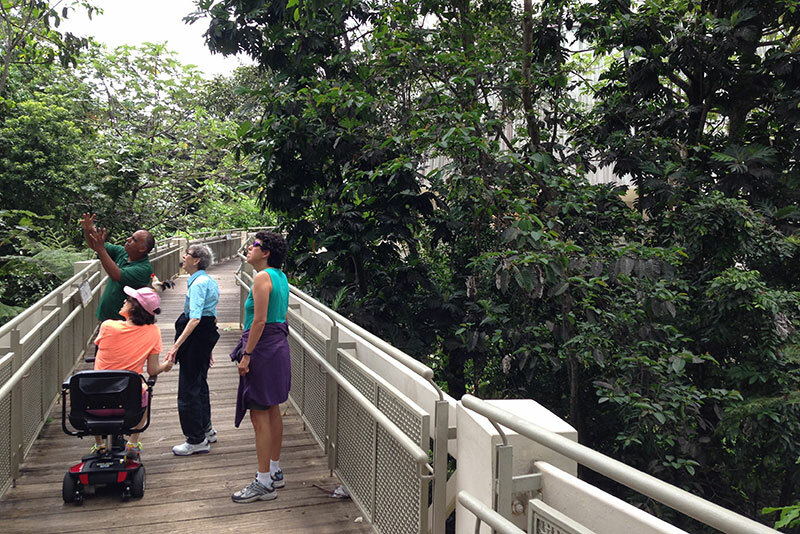 We were intending to go on another short trail, but that one turned out to be closed for some reason. 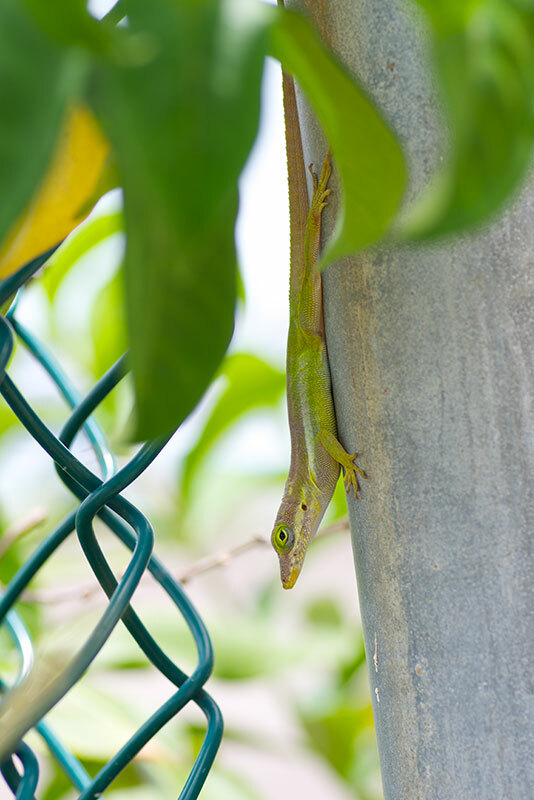 However, by the bathroom at the parking lot for that trail, I spotted another new anole while others were on a bathroom break. 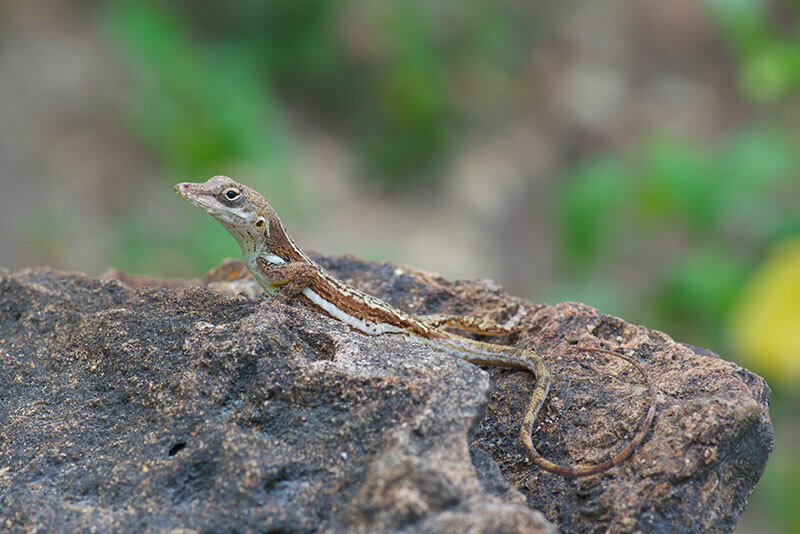 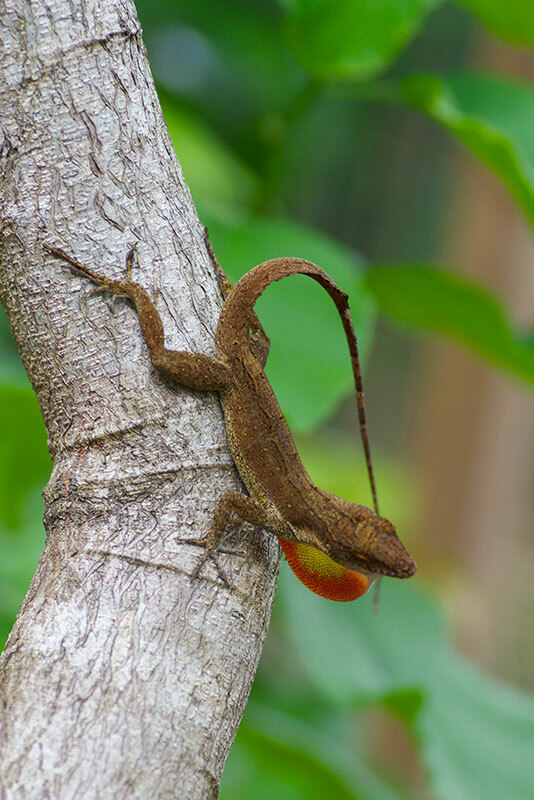 This is an Olive Bush Anole (Anolis krugi). 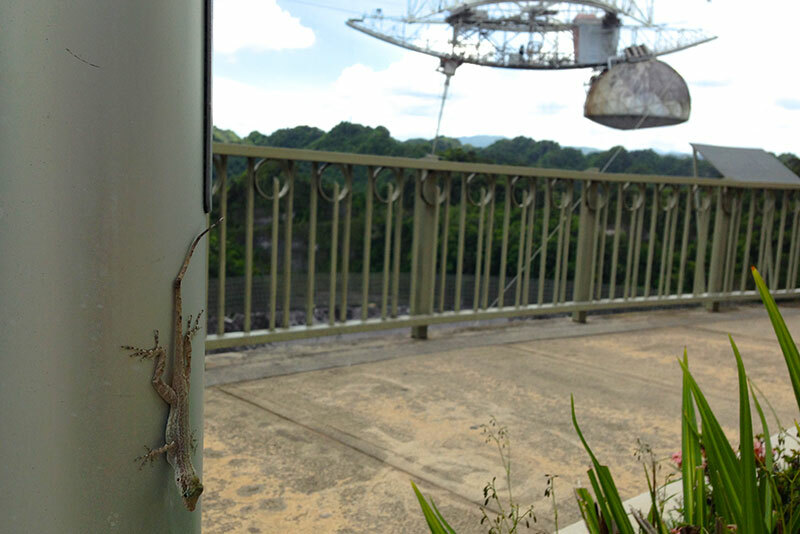 The next day we visited the Arecibo Observatory, home of the world's largest single-dish radio telescope. 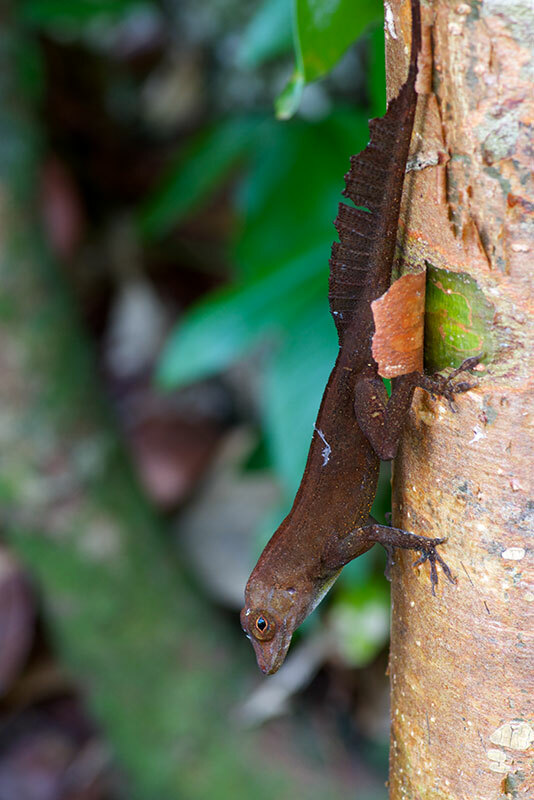 (I believe I am contractually obligated to mention that this dish was featured in the films Contact and Goldeneye, at least.) 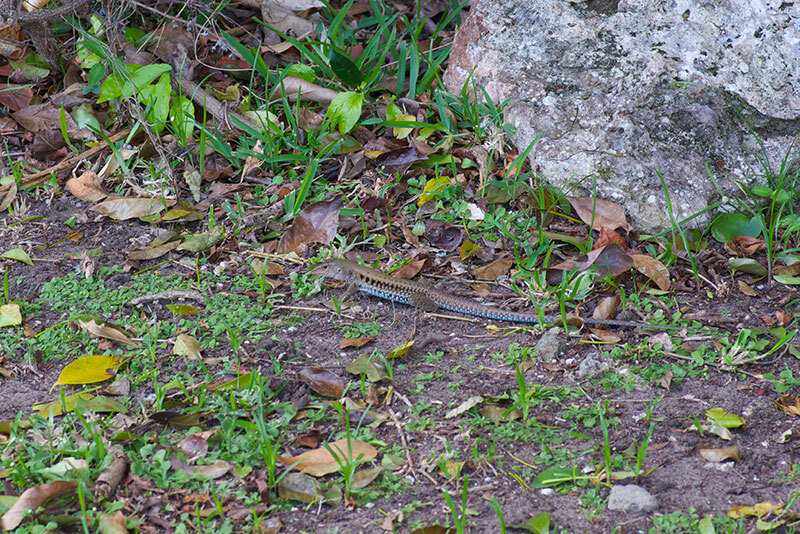 We were there for perhaps half an hour. 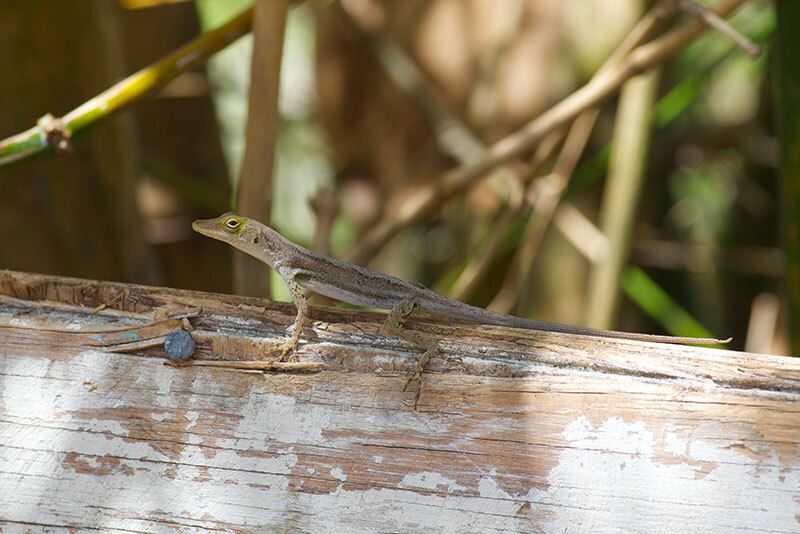 In that time I saw a video about the history of the observatory, admired the giant dish itself, and photographed three species of anoles. 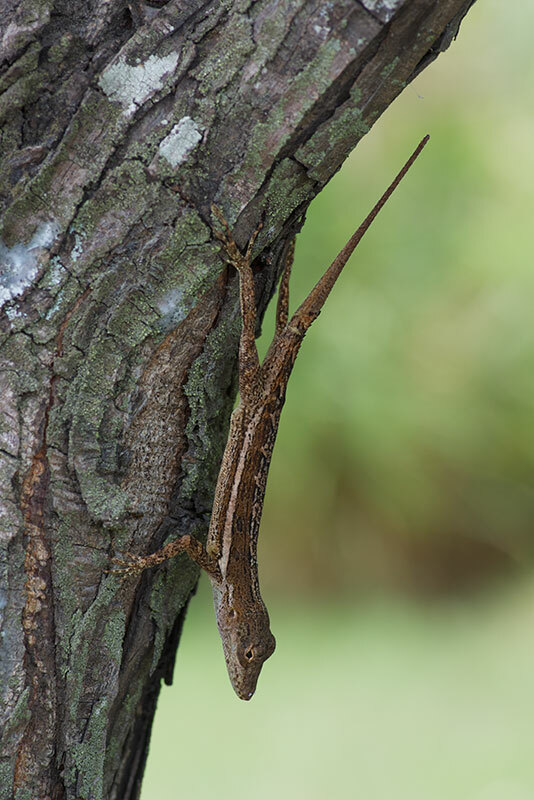 My favorite anole on Puerto Rico was this crazy-long-tailed Puerto Rican Bush Anole (Anolis pulchellus). 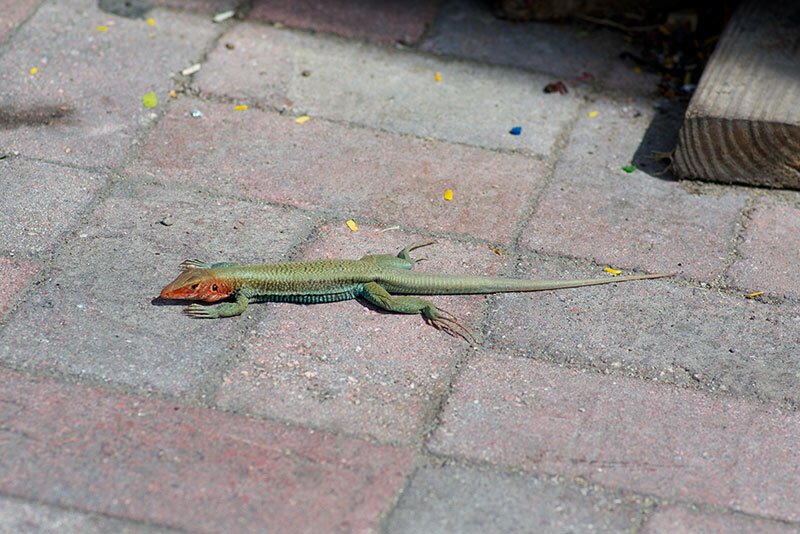 I first saw it on a post on the visitor center patio; later it had moved down into some potted plants. 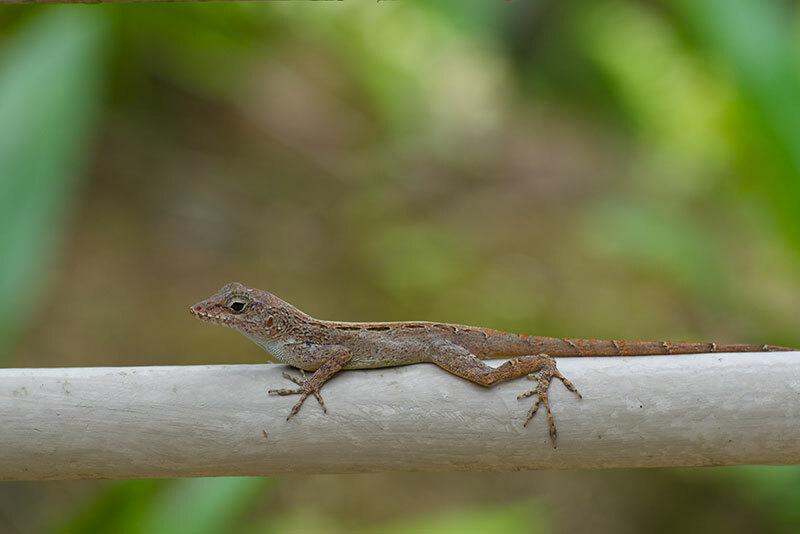 These are purported to be the most common anole on Puerto Rico, but I only saw two of them, compared to perhaps a hundred Anolis cristatellus cristatellus, so I guess I wasn't looking in the right places. 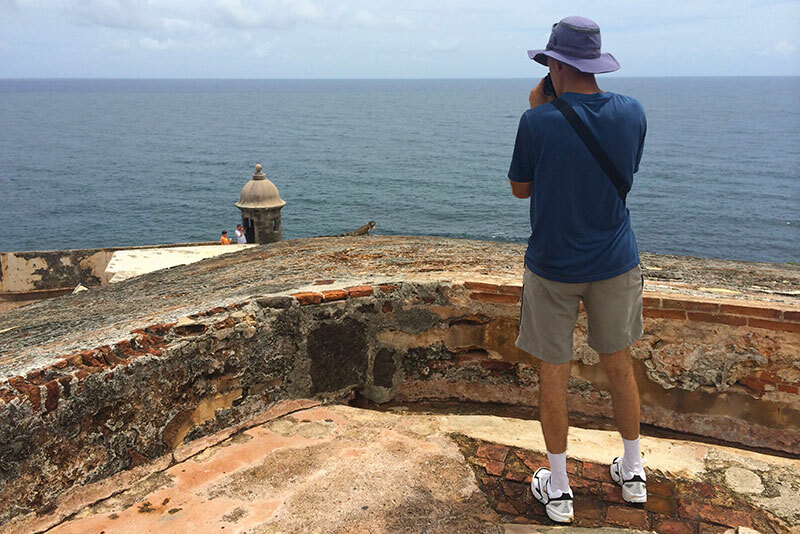 From Puerto Rico we boarded our cruise ship and visited various islands for one day each. 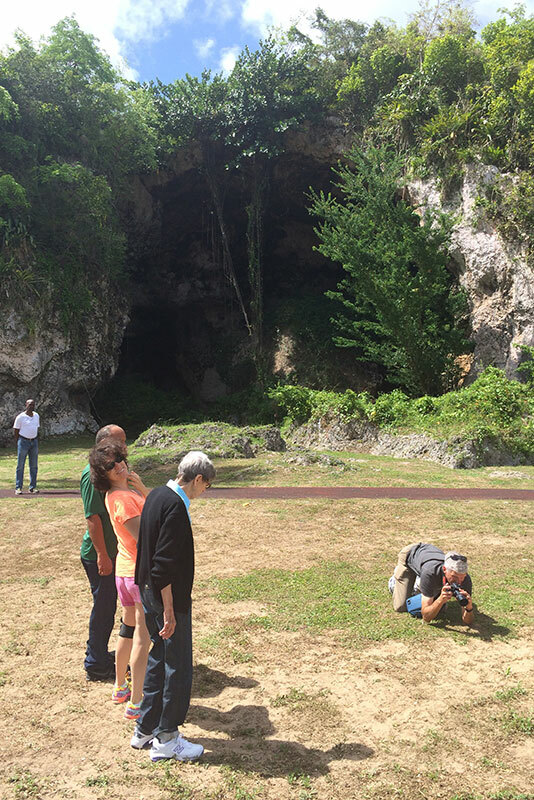 Our first stop was St. Thomas, one of the U.S. Virgin Islands. 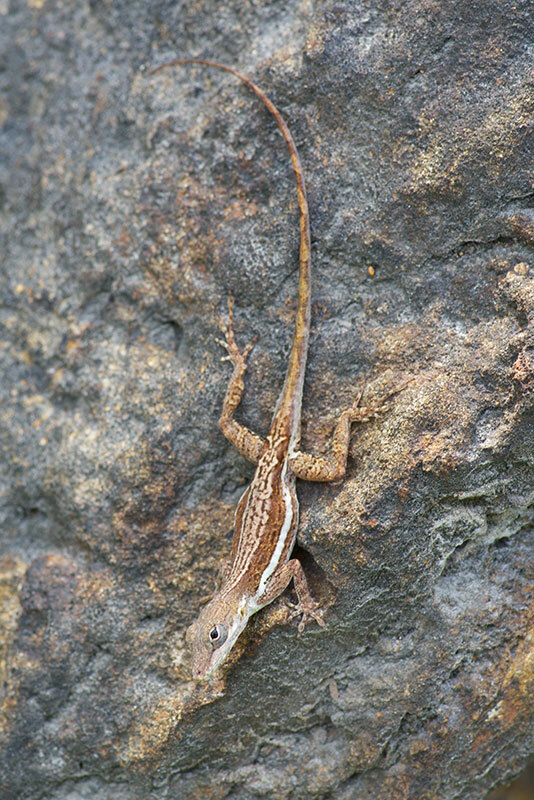 St. Thomas was connected to Puerto Rico during the last Ice Age, so its fauna is essentially a subset of the fauna of the much larger Puerto Rico. 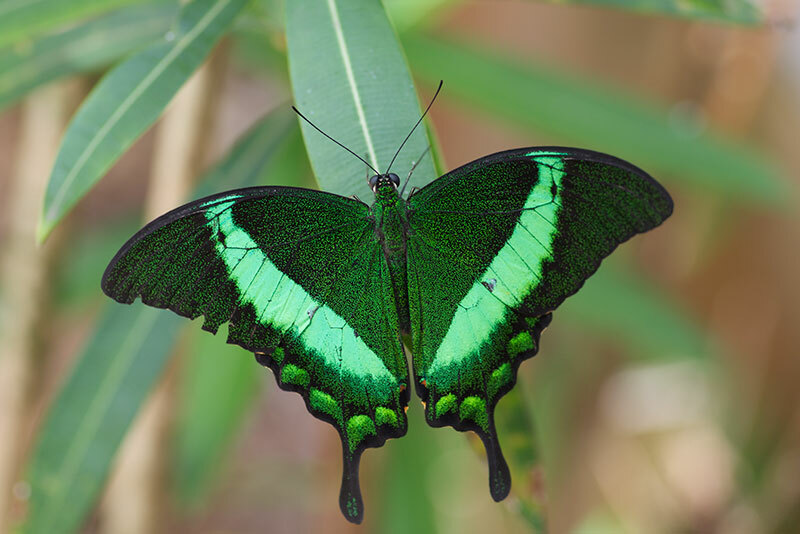 Just to prove we were actually at the Butterfly Farm, here is an Emerald Swallowtail (Papilio palinurus). 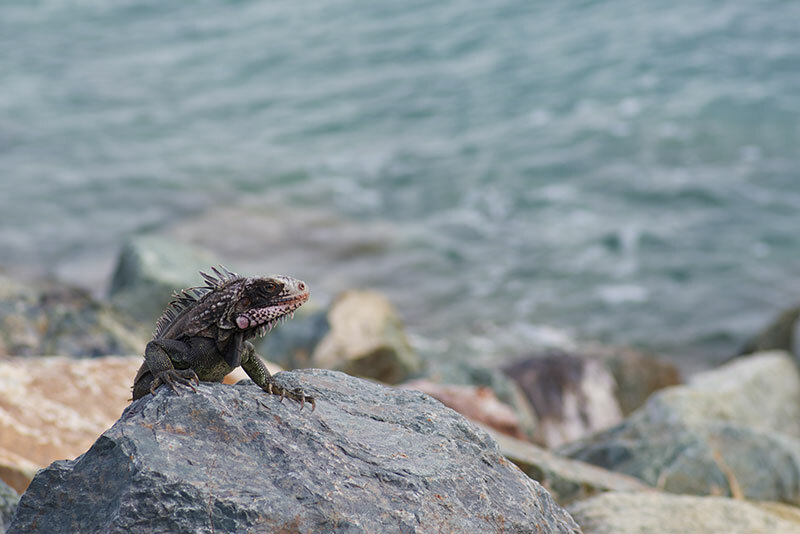 A few iguanas hung out on a rocky seawall. 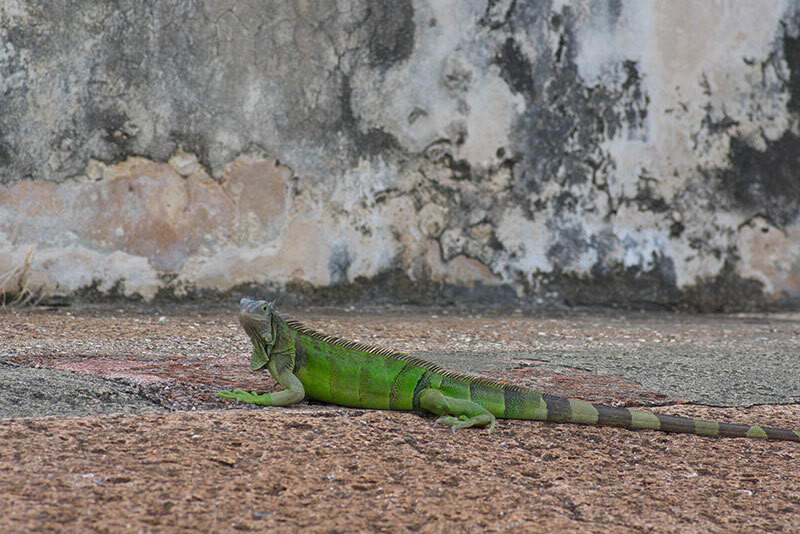 Perhaps they were dreaming of the Galápagos? 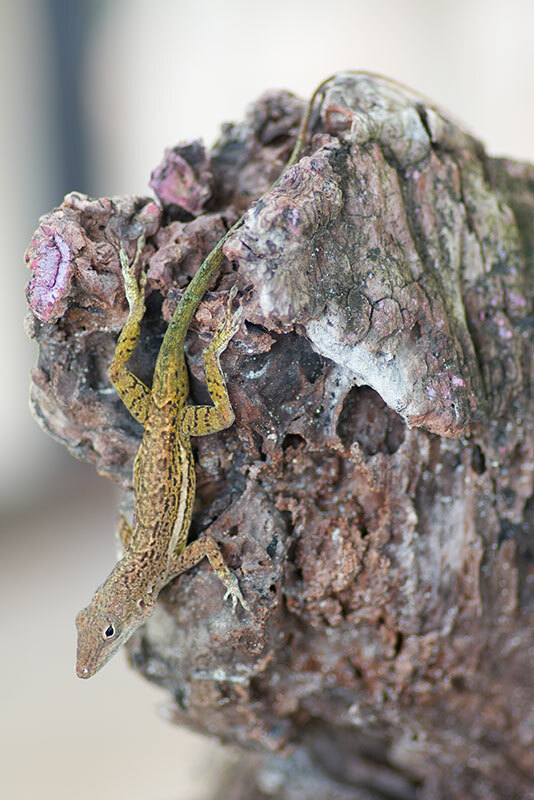 The next day we visited nearby St. Lucia, another one-native-anole island. 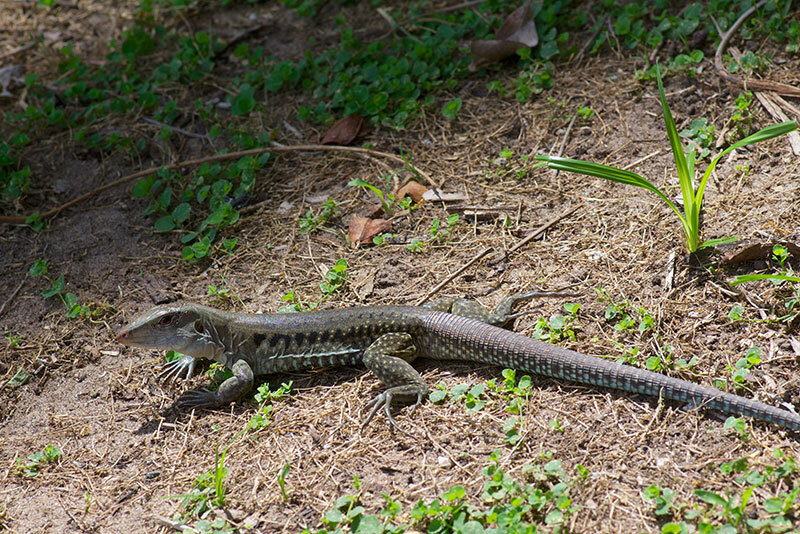 Once again, we were on a nearly-whole-day-long van tour, so I could only look for herps at the preordained short stops. 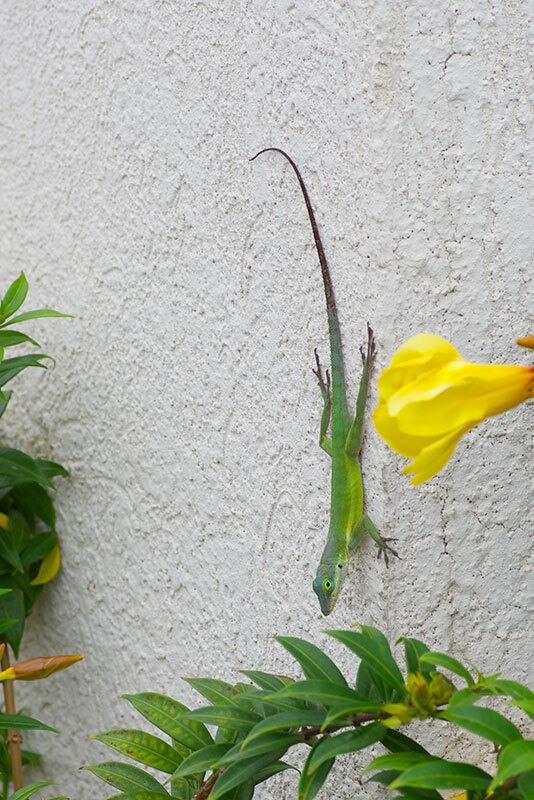 After St. Lucia came St. Kitts, a two-native-anole island, which is non-obviously named after Christopher Columbus. 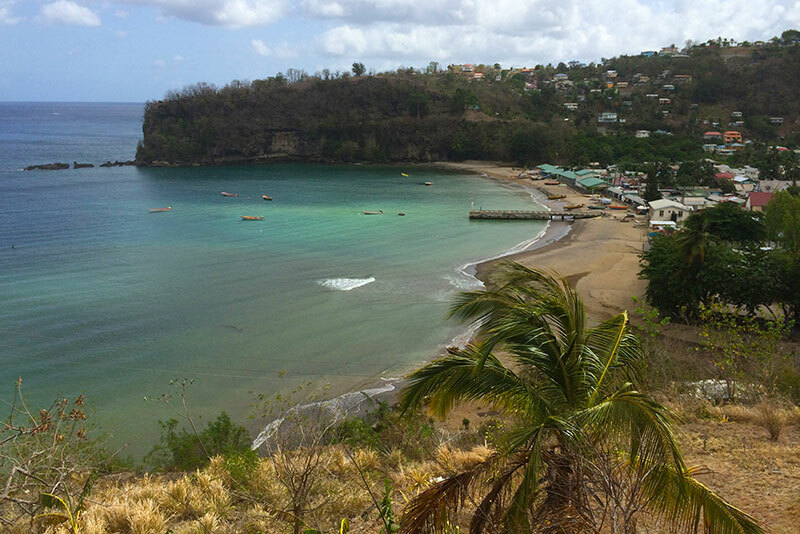 We had opted for a "Rail and Sail" excursion, which started with a ride on a small-gauge tourist train that was once used by the sugar industry, and ended with a catamaran ride back to the cruise dock. 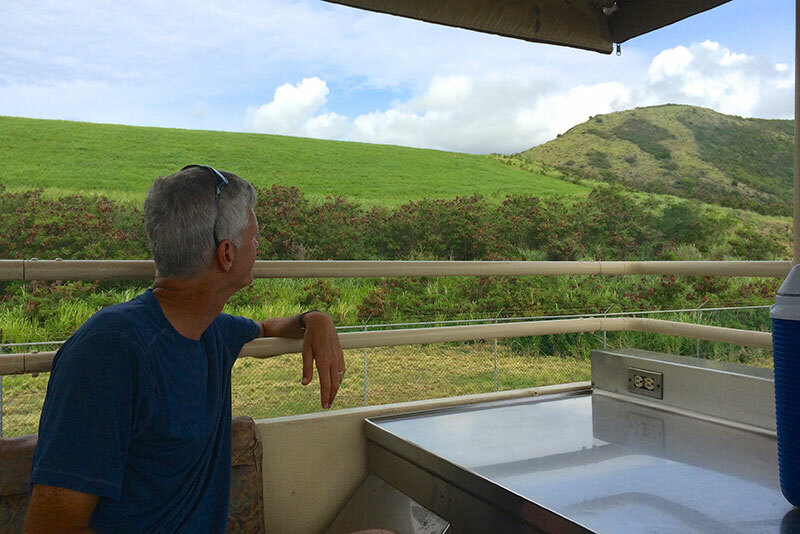 The train ride was relaxing, with nice scenery, though it might perhaps have been more relaxing if I hadn't been carefully studying every bit of passing vegetation for herps. 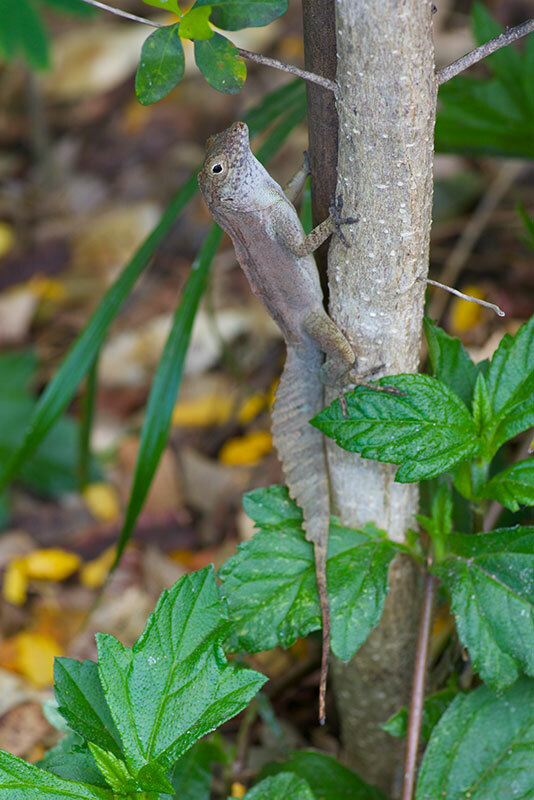 I ended up spotting about a dozen large green anoles, and a few smaller brown ones. 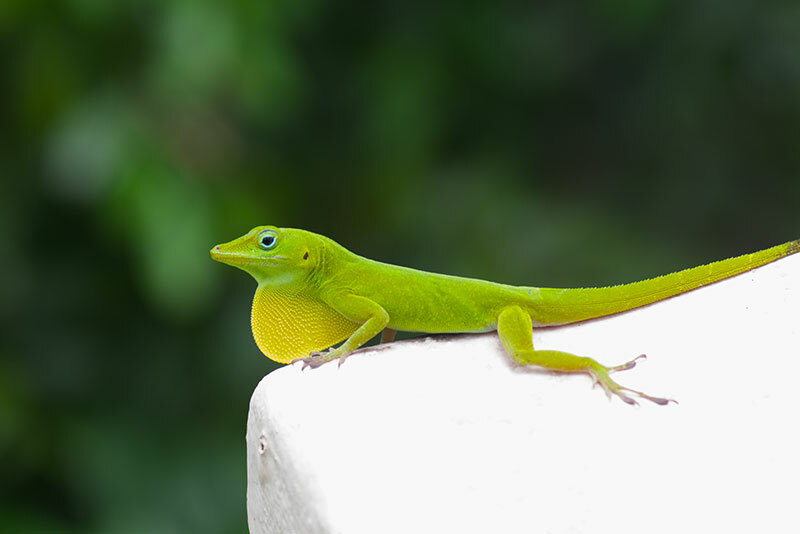 The large green anoles were certainly Statia Bank Tree Anoles (Anolis bimaculatus). 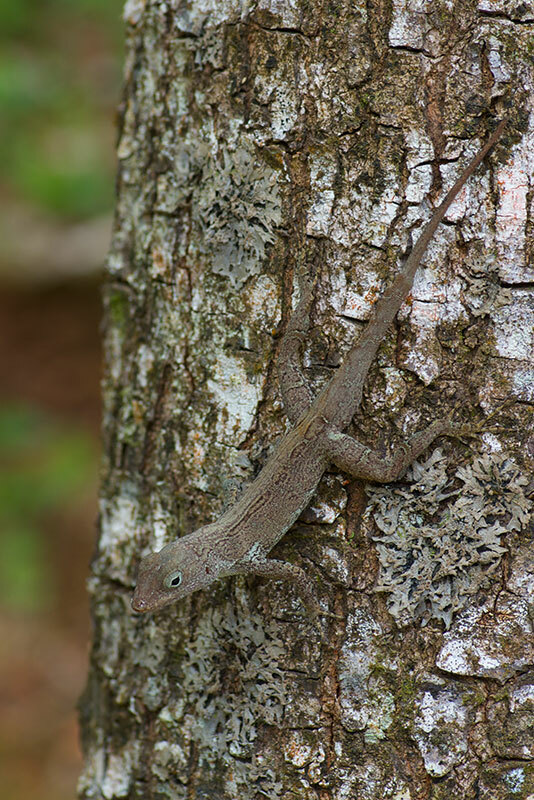 The smaller brown ones might have been Statia Bank Bush Anoles (Anolis schwartzi), but they might also have been young non-brightly-colored Anolis bimaculatus. 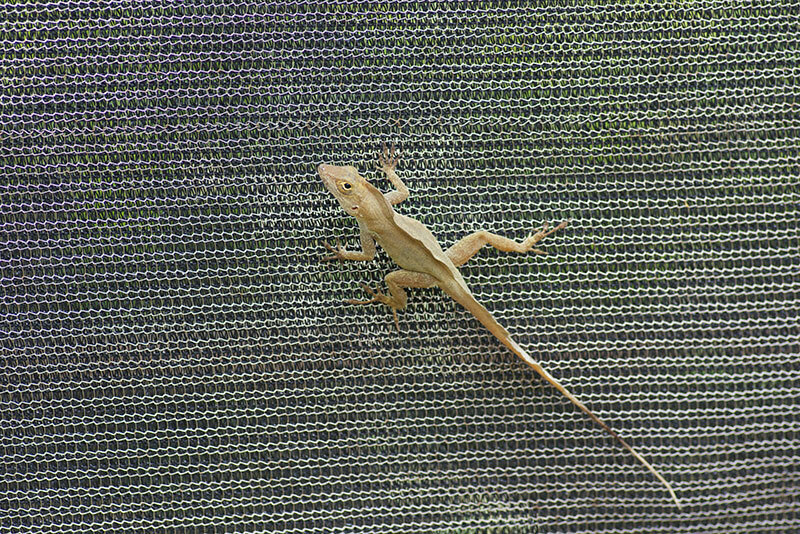 Since I only saw each one for a second or two, I'll never know. 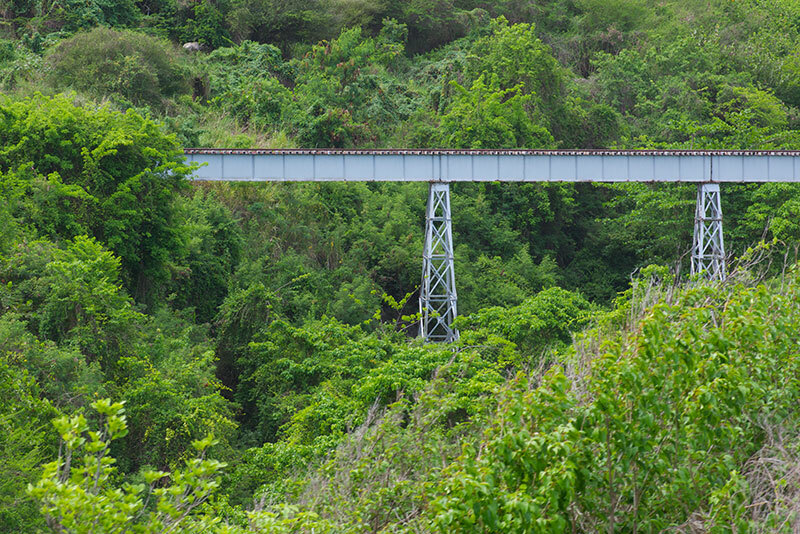 Between the Rail and the Sail, we had fifteen minutes or so of waiting for transportation from the end of the rail line to the catamaran dock. 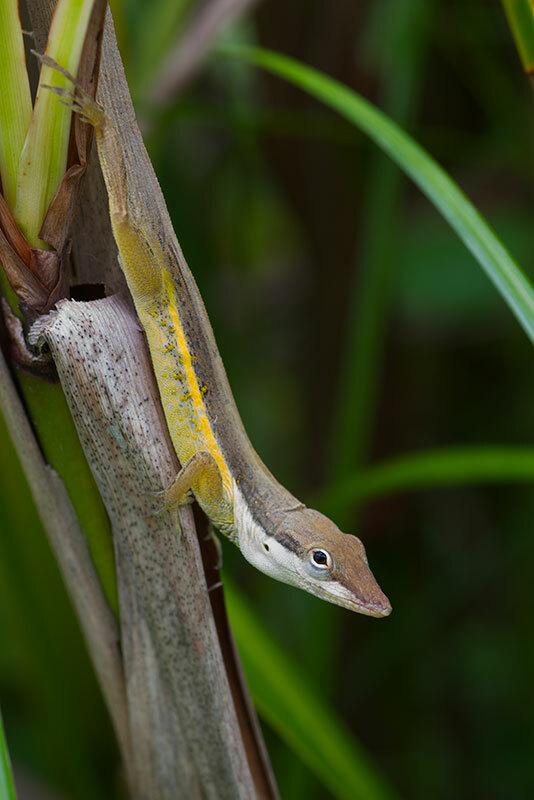 There was grass, and there were some bushes in the grass, so naturally I looked for anoles. 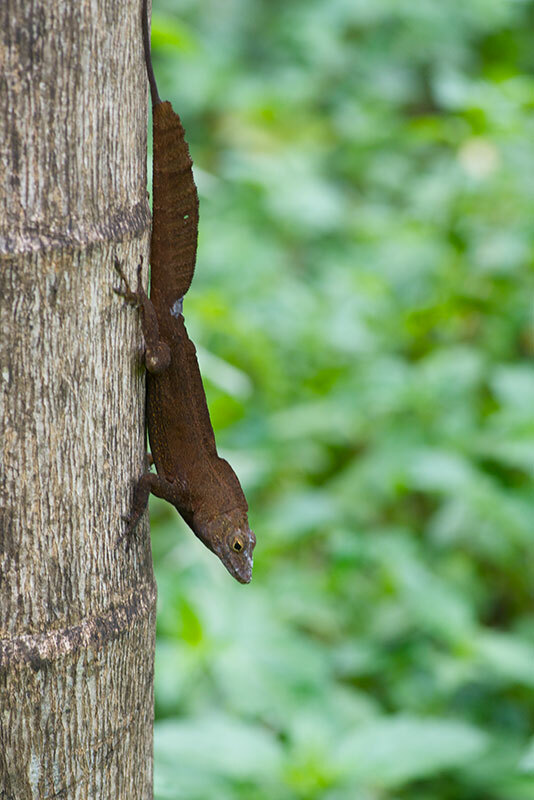 And I found one large and beautiful one, but it did the "squirreling" trick to try to stay concealed, so I don't have a photo that shows how pretty it was. 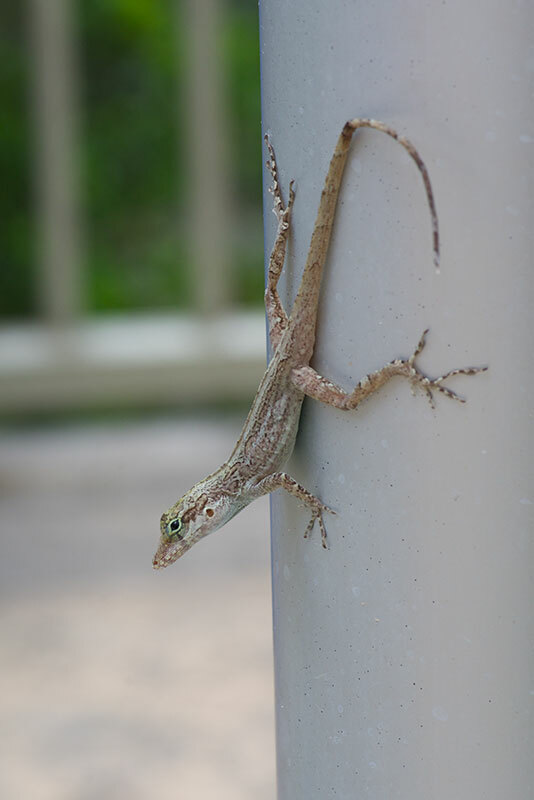 The catamaran ride featured unlimited drinks, nice weather, and ocean, but no herps. 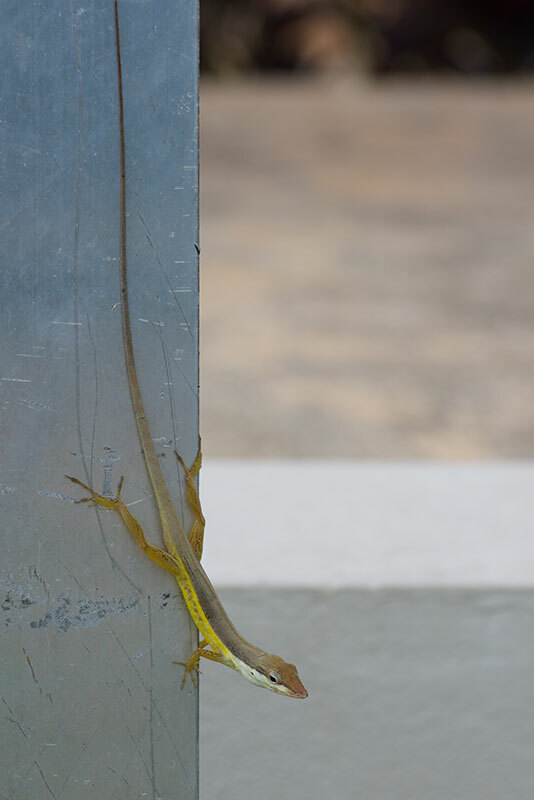 Afterwards we walked around a little in the cruise dock area, where I spotted a couple more Anolis bimaculatus, though none as large and colorful as that first wary one. 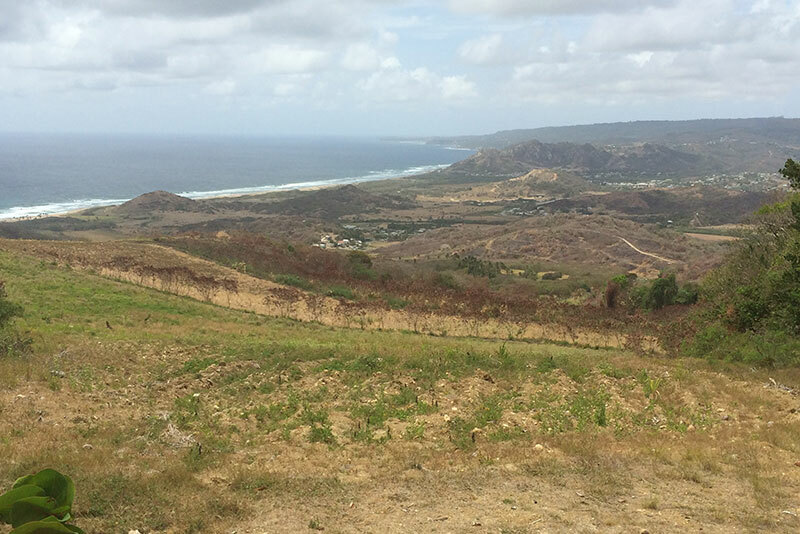 Our final stop was Sint Maarten. 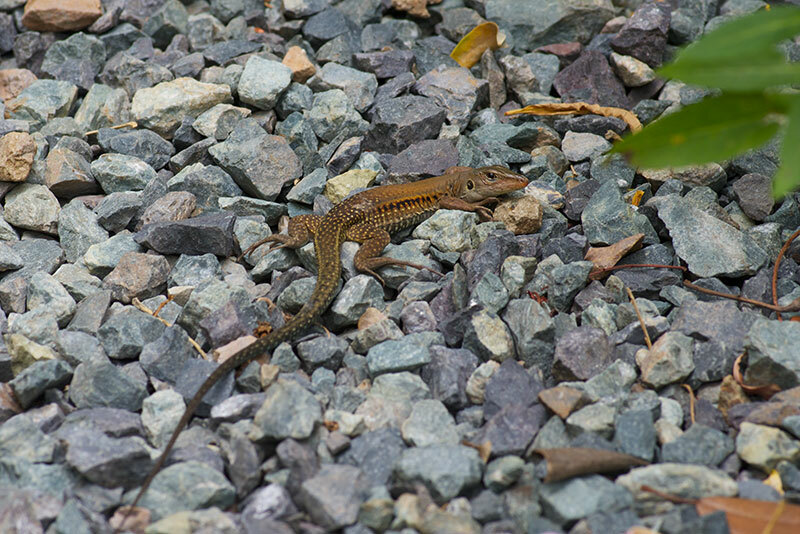 We didn't take any guided excursion here, so I had a little more time to wander around near the cruise dock and spot the local lizards. 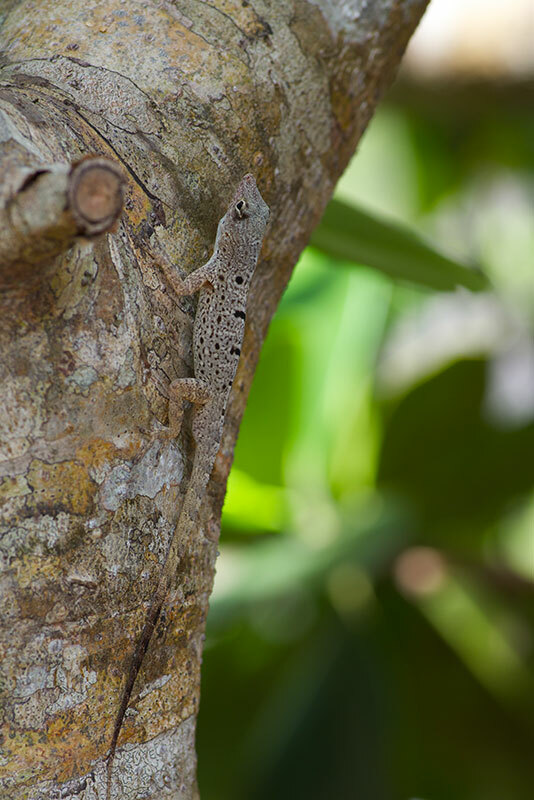 Sint Maarten is a two-native-anole island, but I only saw one of the two species, the Anguilla Bank Tree Anole (Anolis gingivinus). 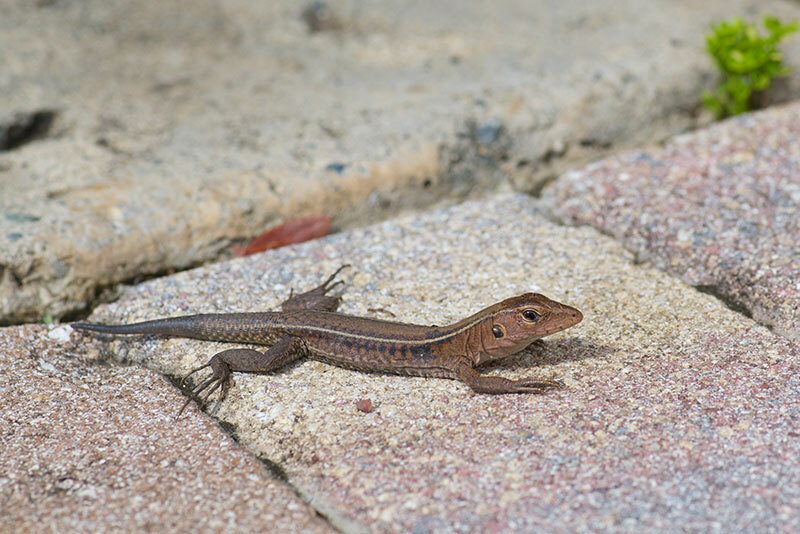 Happily, I saw a lot of them. 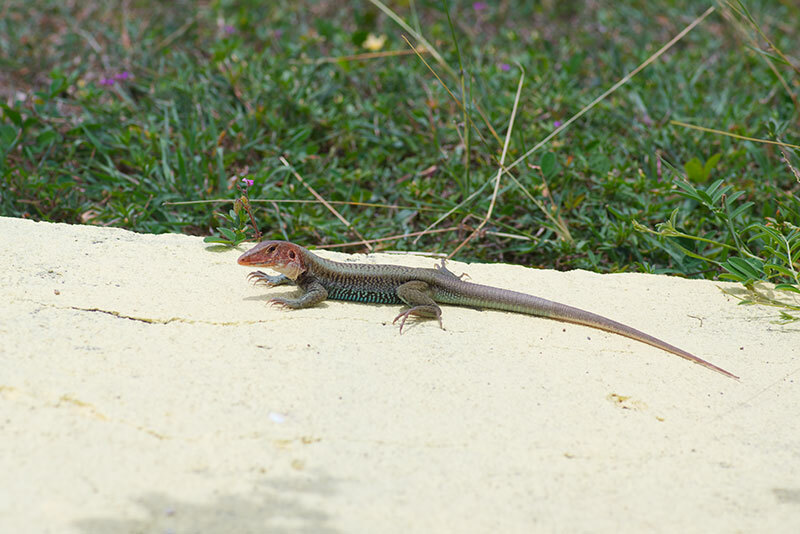 Sint Maarten's ameiva is the relatively unremarkable Anguilla Bank Ameiva (Ameiva plei). 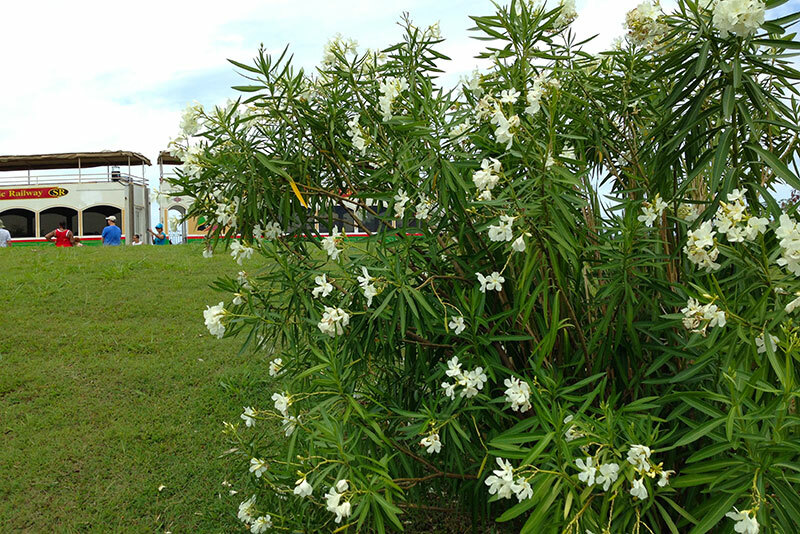 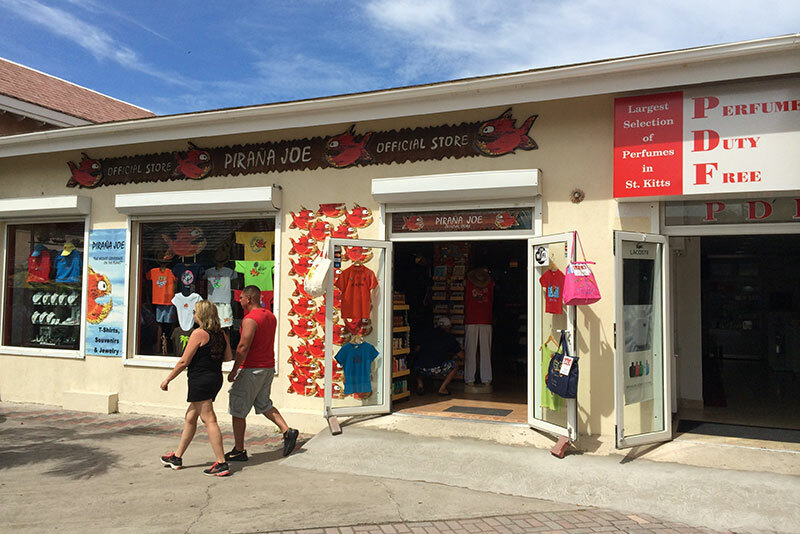 As on the other islands, the ameivas on Sint Maarten seemed particularly happy around human habitation. 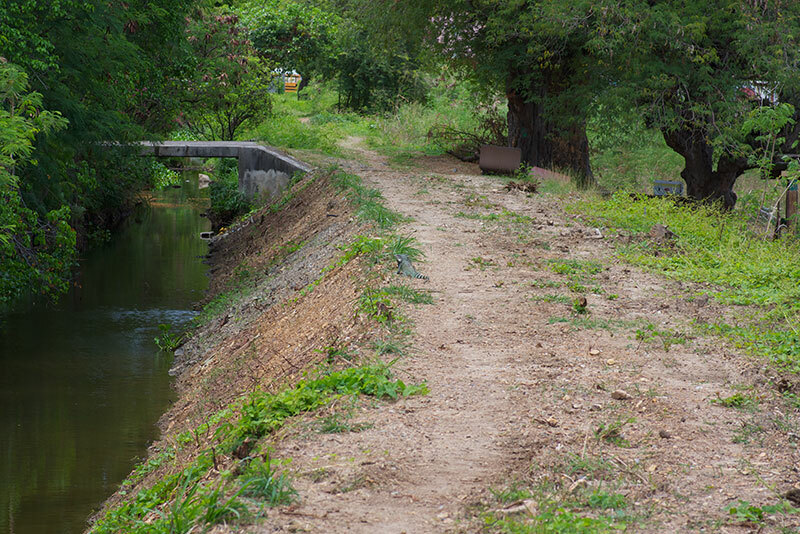 In my wanderings I came across a freshwater canal. 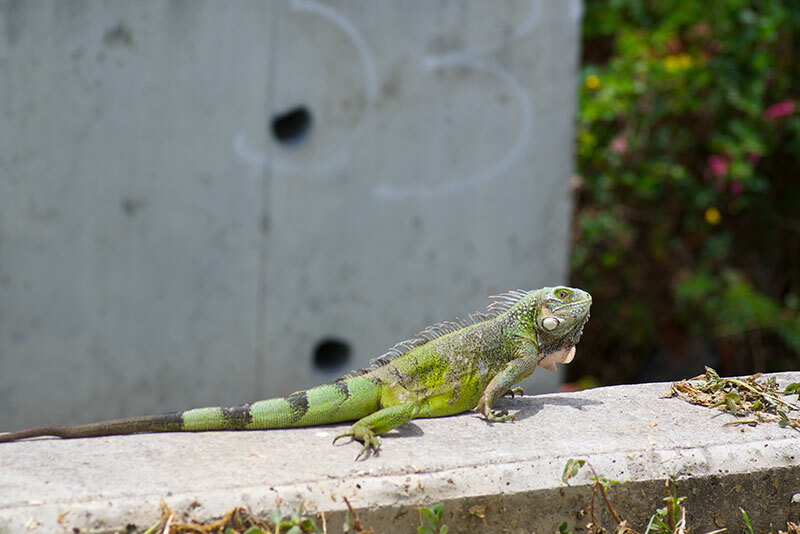 Part of it had dirt banks, and part of it was lined with concrete. 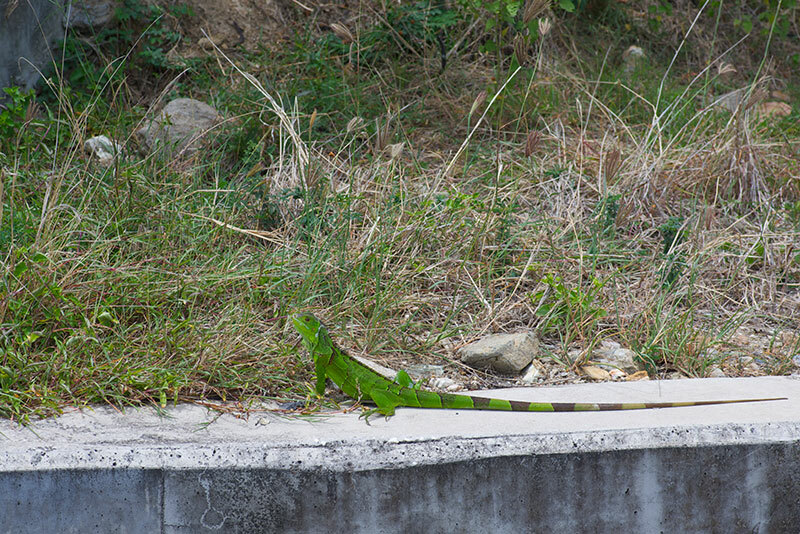 Both parts featured plenty of Iguana iguana. 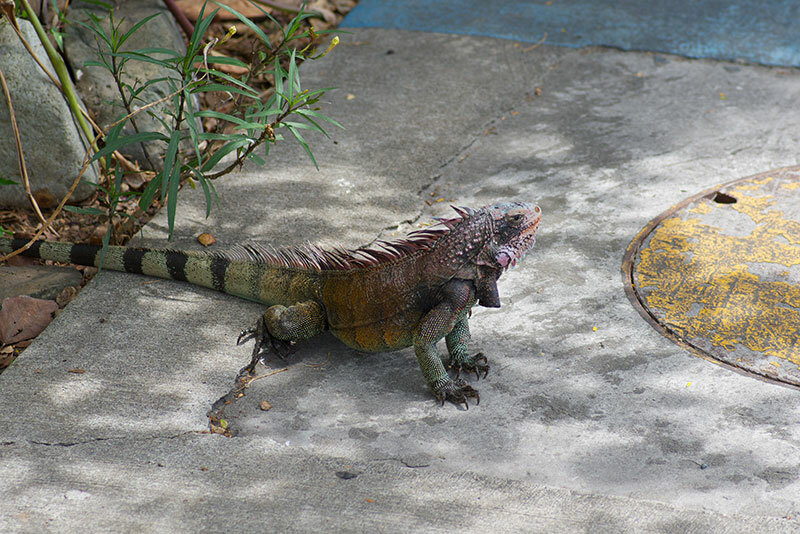 It's smaller cousin, the Caribbean's indigenous Iguana delicatissima, used to live on Sint Maarten but has been extirpated from there as well as from many other islands. 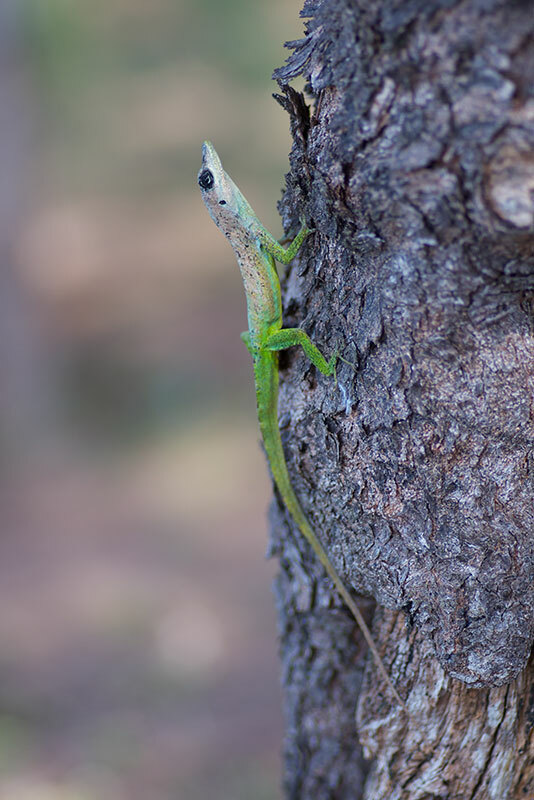 Seeing a bunch of different anole species made me want to learn more about them, so when I got back from this trip the next book I read was Jonathan Losos's wonderful "Lizards in an Evolutionary Tree: Ecology and Adaptive Radiation of Anoles". 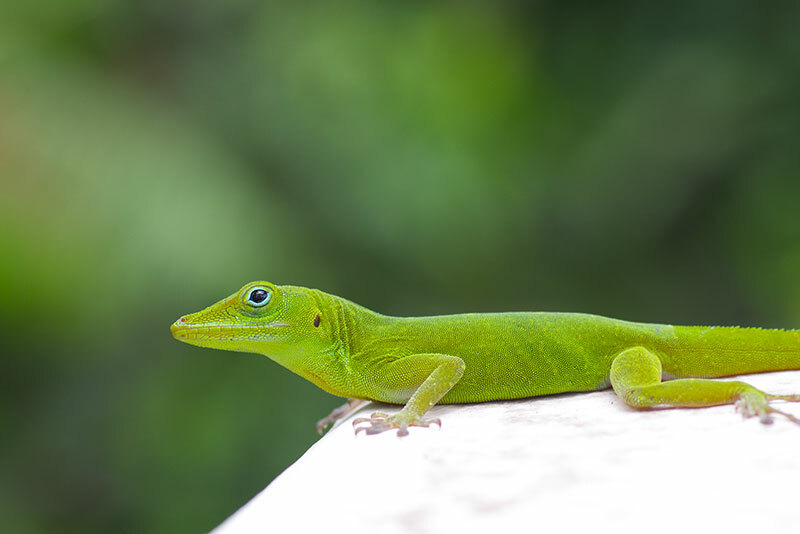 Now I have the anole bug, and I hope I have the opportunity to visit many other parts of the Caribbean someday to see lots of different anoles. 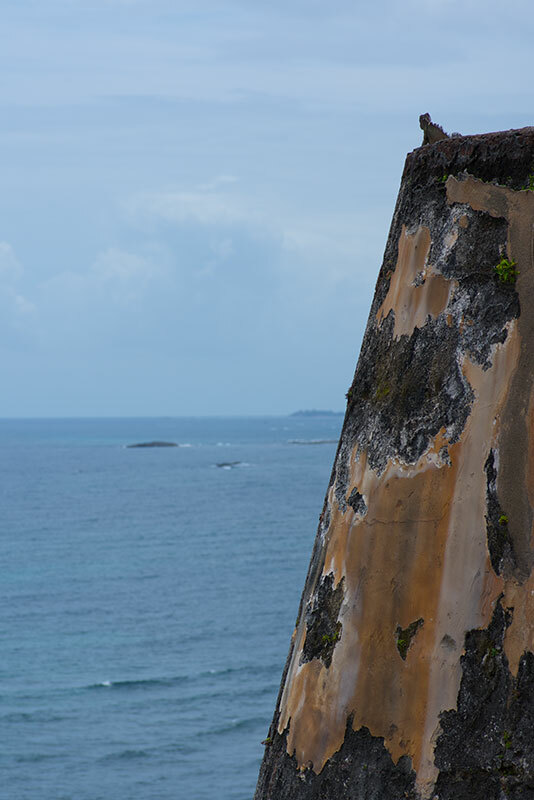 Probably not on a big cruise ship, though.